Many new things for MobileJuicing.com again this year, but first, we are introducing a unique packaging option called ‘Pouch-Up’. Attractive to consumers for the extended shelf life, ease of use, and aesthetics, it is sure to up your sales! The self standing pouch utilizes the same Vitop tap for dispensing, is good for 2 months after opening and is very convenient. We have our cherry and berry juice clients in mind with the smaller 1.5L format that will offer a better return to growers through increased sales and a lower consumer price point. Please contact us today for a price list. The 1.5 liter pouches will be plain white with no design on it at all. Lots of room for all your own labeling. 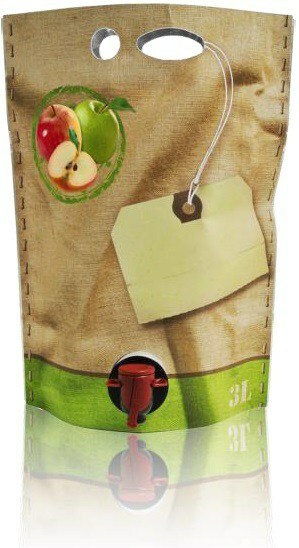 For you awesome apple growers, we still have a few 3L and of course lots of 5L bag-in-box, but if you think Pouch-Up is right for you, we just ordered a bunch. Please let us know if you would like a 3 liter pouch-up for your apple juice and we’ll happily supply that for you. It will look exactly as the image above.